All inclusive Morocco holidays mix the old with the new in Marrakesh spice markets and Agadir pubs and clubs. The country brings old world Arabian nights bang up to date with its soft golden beaches, exotic nightlife and world class entertainment such as traditional singing and belly dancing. On all inclusive 2019 / 2020 packages in Morocco you can shake off stress by playing a few rounds on top class golfing resorts, trying your hand haggling over some locally made souvenirs or simply unwind with a lazy day at the beach. Flight time from UK: 3 hrs 20mins aprox. Morocco holidays are best taken between March to May when the greenery thrives with heat. Autumn months between September and November are also warm enough to enjoy although the nights will start to feel colder. 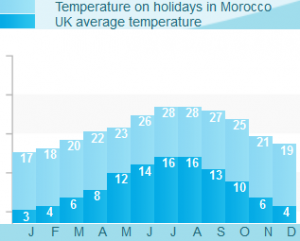 Holidays in Morocco during the Summer months are usually extremely hot so if you are planning to travel around this time please take care to carry around plenty of water and stay out of the midday sun. All inclusive holidays Morocco are also great for keen surfers. Taghazout near the beach resort of Agadir is a surfer’s paradise with Anchor Point being the hub of the surfing scene there. Tourists come from across the globe to surf the coast’s massive walls of water as they roll into the beach. Taghazout caters for all your surfing needs on Morocco all inclusive with its own vast array of shops selling and hiring out wet suits boards and even a few souvenirs to remember your exhilarating day riding the waves at Anchor Point. Morocco welcomes you into another world where exotic fantasies become reality within the crowded cobbled streets scented with ancient herbs and spices.